The tragedy of RSO Deputy Sheriff Peter Martin’s death left his family with a large void in their lives and some sorely needed happiness during the Christmas holidays. Thanks to every RSO Deputy Sheriff contributing through payroll deduction, The Debbie Chisholm Memorial Foundation gave them a Christmas to remember! 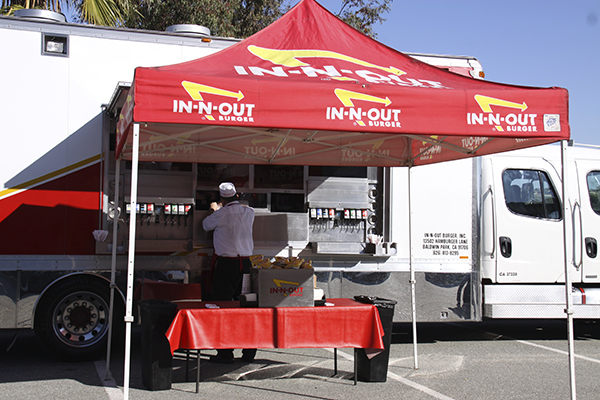 On 19 December, 2015, the largest group of volunteers, Police and Firefighters ever assembled by DCMF gathered at Fire Station #3 in Murietta. 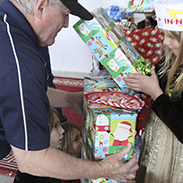 Numbering more than 30, we convoyed to the home of Jessica Martin and her children to unload a truck load of gifts. In addition, DCMF also sent the family to Disneyland for two days all expenses paid! 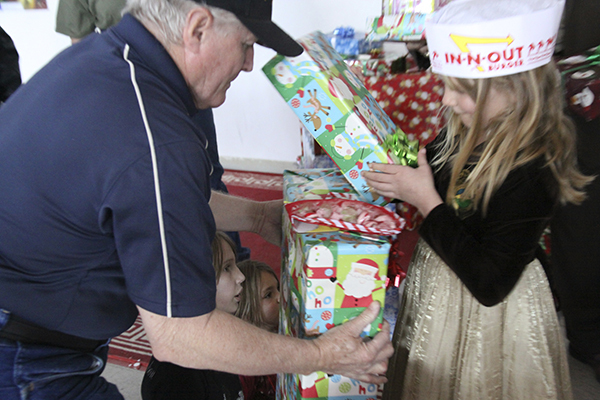 It was an emotional day and the family was so overjoyed that we included them in our Christmas giving. DCMF President Theron Reed and board members Bonnie and Crystal Reed wrapped and delivered another truck load of gifts to the Tapia family in Riverside. CHP Officer Travis Monks led the procession of fire trucks from CDF Station #17 who also brought Santa Claus along, much to the delight of the children. Unfortunately, three-year-old Catherine was taken back to Loma Linda and missed St. Nick and his toy delivery. Christmas may be delayed a little but Catherine won’t miss out, and that’s a promise! 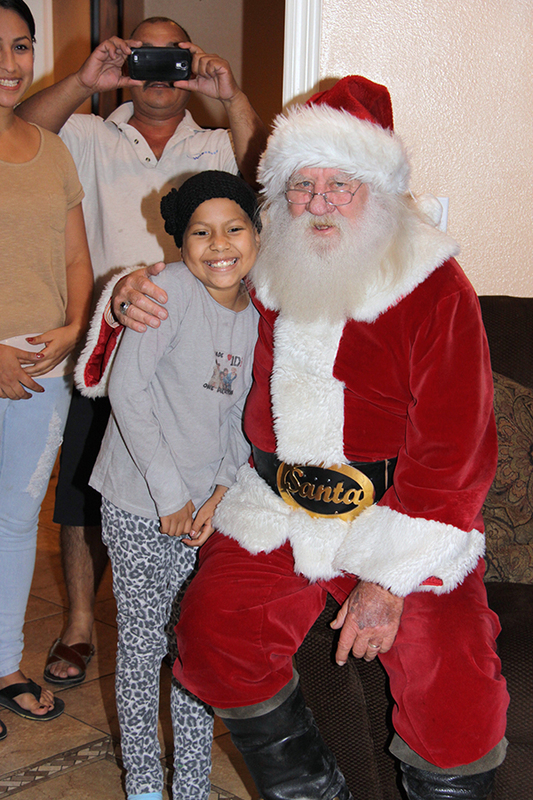 A Christmas stop in Moreno Valley, organized by DCMF Treasurer Judy Drott, brought smiles to the faces of the Arteaga family, especially 14-year-old Darlene who is battling cancer. Darlene was overcome with happiness when she saw the CHP unit and fire units from Station #2 stop in front of her home with lights and sirens blazing. Today she had a moment to forget all about cancer and enjoy being a child again. In Hemet, we visited six-year-old Violet Mallet, a darling little Princess who is fighting cancer with all the strength she can muster. Prior to Santa coming, Violet and her brother Sage helped Mrs. Cathy DeHart, her daughter Elise, Elise’s boyfriend Kenny, Kylleen Coogan and me decorate the beautiful Christmas tree donated by Mrs. DeHart. Naturally we followed this up by stuffing arms loads of gifts under the tree. 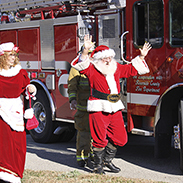 Thank you Hemet Fire for transporting Santa to their home. We also journeyed to Indio to the home of former RSO Deputy Sheriff Angelina Castleberry to help her family of seven to have a very merry Christmas. Her infant son is suffering from a life threatening illness and the burden of medical bills had put a real damper on their Christmas. When Kylleen Coogan and I left, their Christmas tree was smothered in gifts for the wide eyed kids. Many thanks to our support members and volunteers that also included Supervisor Chuck Washington, Lake Elsinore Mayor Brian Tisdale, RSA President Robert Masson (he attended all gift deliveries), Pechanga Tribal Police Chief Dave Nelson and his officers, The Firefighters from all cities, Fausto Atilano and Melissa Lippert, Lake Elsinore Deputy Sheriff’s, Murietta Police Officers, Terry Gilmore and Becky Young of Paradise Chevrolet, Buick, GMC of Temecula, Shawn Sorenson of Exit Alliance Realty in Temecula, Brenda Aguilar of Ameriprise Financial and of course all of the families for allowing us to be a part of their lives. 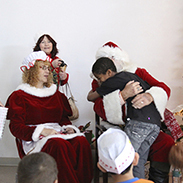 The Debbie Chisholm Memorial Foundation brings Christmas to 90 sick and abused kids! 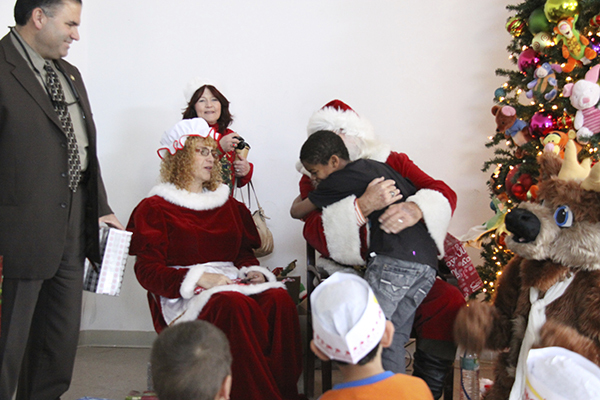 Christmas 2013 was a very special time for DCMF and the children we serve. This year we provided over $45,000 worth of gifts to sick and severely abused children through our “Spirit of Christmas Program”. 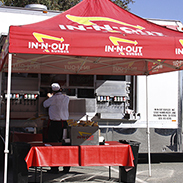 The 88 kids currently housed at the Childhelp Merv Griffin Village, in Beaumont, were treated to lunch by DCMF as we brought the In-N-Out Burger truck to their location. 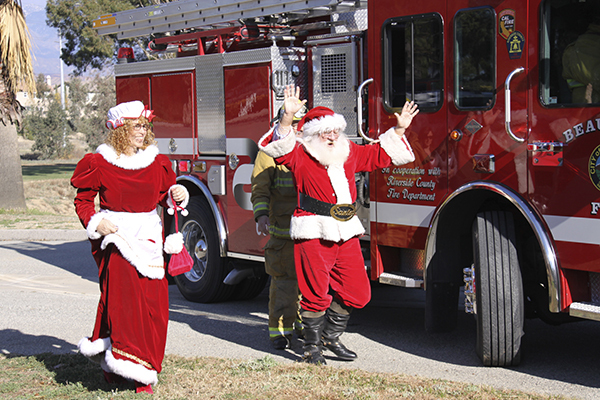 That was followed by a convoy of police and fire vehicles that delivered Santa and Mrs. Claus along with car loads of gifts. 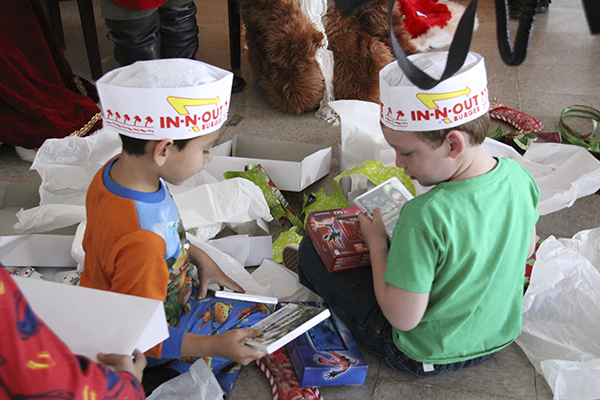 What made it really exciting is the fact that the kids got to choose exactly what they wanted for Christmas! 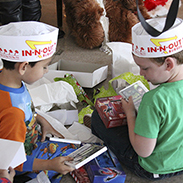 Their gift tally included (44) IPod Touch devices each with a $100 ITunes card and a set of headphones. Also, (18) Nintendo 3DS XL with games, (4) Sony PS Vita game consoles with games, a Nikon Camera, a portable Blu Ray player with movies and (20) smaller children chose toys from the Toys-R-Us catalog. In addition, we also made two home visits to kids who have cancer and delivered about $7,000 worth of Christmas presents to these wonderful children. 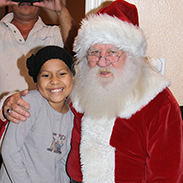 This coming year marks the 20th year of operation for DCMF as we have granted 406 wishes and delivered over 3,000 spirit lifting gifts to kids at Loma Linda University Children’s Hospital. Thank you RSA, SEBA and all of our events sponsors for being partners year after year enabling us to accomplish amazing things for sick and abused children.